For decades US nuclear power exporters have had difficulty countering the criticism that their wares give an importing country a big leg up on getting a bomb, contending that this was not so. Now comes Michael Shellenberger, a prominent nuclear power advocate, who casts all this aside. Yes, he writes, there is a strong link between nuclear electricity and weapons, and in fact most countries that built nuclear power plants did so with weapons at least partly in mind. But this is not so much a confession as a sales pitch. He thinks the weapons potential of nuclear power plants actually prevents war—the weapons shadow cast by nuclear plants itself deters enemies—and that this attribute should be exploited as a sales advantage by US nuclear exporters. Decades of deceit have been thrown overboard with the new nuclear sales pitch. it openly links nuclear power to weapons and argues that weapons programs will be jeopardised unless greater subsidies are provided for the civil nuclear industry. In 2015, Nuclear Monitor published a detailed analysis of the many ways nuclear industry insiders and lobbyists trivialise and deny the connections between nuclear power – and the broader nuclear fuel cycle – and nuclear weapons proliferation. Since then, the arguments have been turned upside down with prominent industry insiders and lobbyists openly acknowledging power—weapons connections. This remarkable about—turn has clear origins in the crisis facing nuclear power and the perceived need to secure increased subsidies to prevent reactors closing and to build new ones. 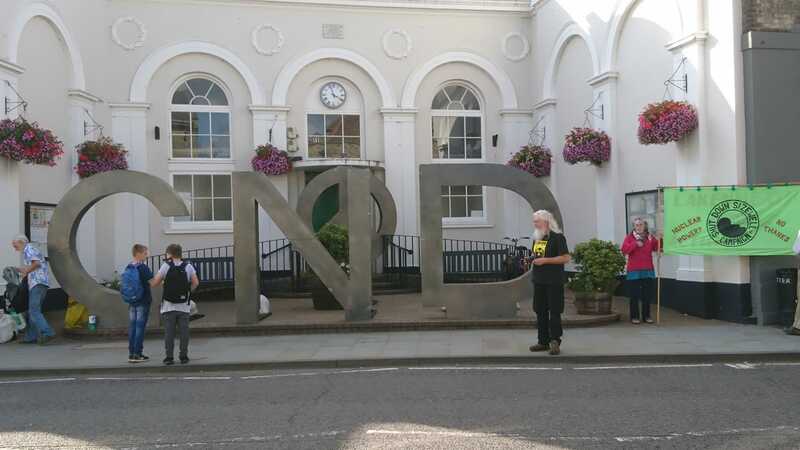 We were greatly appreciative therefore when London’s KickNuclear/RisingTideUK group brought the CND symbol to Sizewell and Saxmundham to emphasise the weapons—power link. They reminded us that at the inception of the ﬁrst Hinkley point nuclear station in the 19505 a proportion of its “waste” fuel rods were directly designated to provide the plutonium for the ﬁrst nuclear weapons the UK was struggling to build. That proportion was subsequently increased by our warlords, desperate to clamber onto the nuclear—capable high table at the UN.